On 26th August 2017 R.S. Pura Unit of CSSS participated in “Sankalp-se-Sidhi” – Determination to Achievement - programme at Krishi Vigyan Kendra, R.S. Pura. A total number of 55 progressive farmers and self-help group members participated in the function from our target areas. On this occasion Shri. 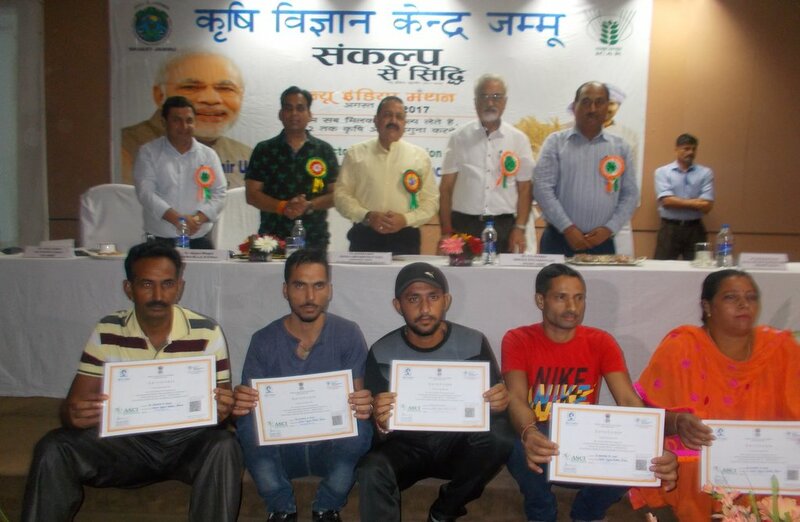 Vinod Kumar (Farmers club, Kaloyan) and Asha Kumari(Farmers club, Motey) received certificate from Agriculture Skill council of India for successfully clearing the assessment for the role of mushroom growers conforming to National Skill Qualification framework-level IV. The Chief Guest Dr. Jitendra Singh, Minister of state for Development of North Eastern Region and PMO, awarded the certificates. The function provided an opportunity to PRAGATI SHG (vill. Balachak) to exhibit their stall The team of enterprising women received tremendous appreciation from the Chief Guest, Dr. Jitendra Singh. He applauded the collaborative efforts of CSSS and KVK R.S. Pura for the great work and encouraged them to continue such collaborative activities in future as well. While speaking to the members of PRAGATI SHG, he motivated them to establish permanent market linkages for their product and also assured them of help from their side whenever they need. 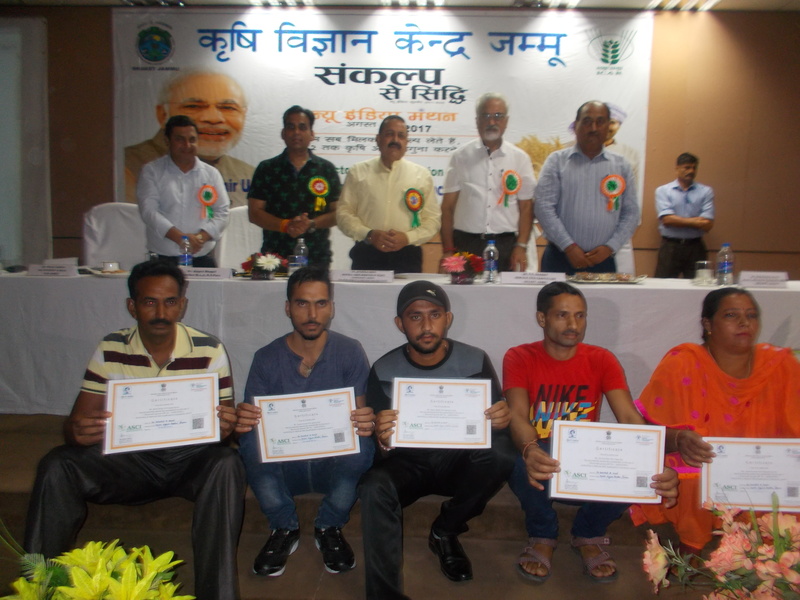 The programme witnessed presence of more than 500 farmers who took pledge along with the chief Guest, Dr. Jitendra Singh, Dr. Gagan Bhagat, MLA R.S. Pura, Prof. Pradeep Sharma, Vice chancellor SKUAST-J and many other department officers and scientists to work for doubling the income of farmers by 2022.